History of the Stebbins Name The STEBBING family is of great antiquity in England; the oldest branch resided in Yorkshire and is descended from Sir Thomas STEBBING, baronet. The family name was, and still is in England, STEBBING. The termination ” ing” in the name may be of Saxon origin, and the name may refer to a field or meadow with stubs in it. There are various forms which the family name took: in the town records of Northampton we can find STEBIN, STEBBING, and especially STEBBINS. In Canada the name was given as STEBEN or STEBENNE. All refer to the same family. 818 B.C. Hadding King of Denmark (m) Princess Ragnhild (d) King of the Nitherians had Princess Ulfhild who (m) Scot and founded the Scottish name and had Frode King of Denmark and had Princess Swanhwid who married Regner the King of Sweden. Note: The legendary kings of Denmark are the predecessors of Gorm are often confusing and contradictory. Some say half history and half legend. 486 B.C C Roric Slyngband (swing bracelet) King of Denmark had The dates could be quite far off here. Other records show Roric was born around 700 B.C. 112 A.D. Harold I King of Denmark was killed by Frode his brother but not before he had Harald and Halfdan Note: Frode V was king of Denmark until burned to death by nephews Harald and Halfdan – for revenge and/or the throne? 131 A.D Halfdan II – King of Denmark and Sweden had Halfdan II preferred roving about and turned the throne over to his brother Harald II. Harald II was killed by Frode IV’s son and Halfdan took the throne back. Siwald King of Denmark had Some say Siwald was son of Yngwin (“Yngve”) and that Siwald had a son Sigar who took the throne after him. 683 A.D Harald V. King of Denmark had Some records show Harald V as son of Baldrus of Denmark. Gudfred King of Denmark had Olaf King of Denmark died in 810 so Gudfred’s Nephew Hemming became King . Gudfred’s next son Hardeknud was in line to become king. Gorm is credited with creating one of the more significant burial mounds at Jelling as well as the oldest of the Jelling Stones for Thyra , calling her tanmarkar but (“Denmark’s Salvation” or “Denmark’s Adornment”). Gorm was the father of three sons, Toke, Knut and Harald, later King Harald Bluetooth. His wife, Thyra, is credited with the completion of the Danevirke, a wall between Denmark’s southern border and its unfriendly Saxon neighbors to the south. The wall was not new, but it was expanded with a ditch and earthen foundation topped by a timber stockade above it. The Danevirke ran between the Schlei and the Treene river, across what is now Schleswig. Unknown de Contances; Gunnor, duchess of Normandy; Sainsfrida / Seinfrie de Crépon; Wevia de Crépon, wife of Thorold de Pont-Audemer; Herfast of Crepon and 4 others Harald [VIII?] is said to have invaded Normandy and defeated and captured Louis IV of France at the battle of Dives in 945 and forced Richard to recognize Richard I as duke of Normandy. Richard I married Harald’s Daughter, Princess Gunor (b. 936). Gunor Princess of Denmark, Married Richard I, Duke of Normandy and had Richard the 2nd, who had Richard 3rd, who had Lady Alice of Normandy had Ralph, Earl of Chester (m) Maude d’ Auveranche (see above) had Randal Earl of Chester had Randal Earl of Chester, had Hugh Earl of Chester had Lady Agnes de Chester who married back into the Stebbins line when she married William de Ferrers 6th Earl of Derby. Herbastus’ Brother Sweyn, became King of Denmark. Sweyn had Princess Estrith who w/Robert Duke of Normandy had Lady Margret of Normandy who w/RIchard goz d’ Auveranche had Lady Maude d’ Auveranche who married back into the Stebbins line when she married Ralph Earl of Chester. about 975 Herfast, Prince of Denmark b about 975 (some say 955) invaded Normandy with Richard settled in Normandy France and had Also called Herfast de Crépon . Note that his sister was Duchess of Normandy, the wife of Richard I of Normandy. Some say Engenulf de Ferriers b. Abt. 950 was father of Lord, Vaugelin but he’d have been 60 years old at that point. “Ferrer” is Norman French and means “to bind with iron” or ” to shoe a horse”. Ferrières in Normandy, the hometown of the de Ferrers family, was an important centre for ironwork. The Ferrers coat of arms shows six black horseshoes on a silver background. They were descended from Henry de Ferrers, 1st Earl of Ferrières, Lord of Longueville, Normandy, and a Domesday Commissioner; he built Tutbury Castle and Duffield Castle and had large holdings in Derbyshire as well as 17 other counties. William came to England with Henry de Ferrers from Normandy, and defeated Harold II at the Battle of Hastings on 14th October 1066. In 1085 the Domesday Survey was begun and all of England was recorded, so William knew exactly what his new kingdom contained and how much tax he could raise in order to fund his armies. William died at Rouen after a fall from his horse whilst beseiging the French city of Nantes. He is buried at Caen. The town of Stebbins England became the ancestral home after William the Conquerer (also a Stebbins Ancestor) conquered England in 1066 A.D. and established Henry de Ferrers, son of Walkelin at Stebbing. One more source states: Henry de Ferriers, son of Walcheline de Feriers, obtained from William the Conqueror, a grant of Tutbury Castle, Stafford, with extensive possessions in other shires, of which one hundred and fourteen manors were in Derbyshire. He must have been of considerable rank, not only from those enormous grants, but from the circumstances of his being one of the commissioners appointed by King William to make the Grand Survey, the Domesday Record, of the kingdom. He was the founder of the priory of Tutbury, which he liberally endowed. Crispin and Macary report: ” Henry de Ferrieres is referred to by Wace thus;” Henri li sire de Ferrieres,” and he who then held Tillieres. He was seigneur de Saint Hilaire de Ferriers near Bernay and the son, of Walkelin de Ferrers, who fell in a contest with Hugh de Montfort I. early in the reign of Duke William, in which both of these noblemen were killed. He had an older brother William, also reported at Hastings, undoubtedly well advanced in years at that time, who died before the compilation of Domesday, where his name does not appear. Henry de Ferrers received 210 manors, 114 of which were in Derbyshire. The seat of his chief barony was Tutbury Castle in Staffordshire, which had previously belonged to Hugh Lupus, but upon the latter becoming the Earl of Chester in 1071, it was granted to Henry de Ferrers, who founded nearby a Cluniac monastery. Henry was appointed one of the commissioners for the general survey in 1085 and richly endowed the priory of Tutbury in 1089. 1062 Robert de Ferrers 1st Earl of Derby born about 1062 Derbyshire, England (christened Charterley, Staffordshire, England) and died 1139 (m) Lady Hawise de Vitre (she was born about 1069 Vitre, Brittany, France) They were married about 1087 in Brittany, France and had Robert served at the head of the Derbyshire men in King Stephens victory over King David of Scotland, was named by King Stephen Earl of Derby. Also Lord of Tutbury, Commander at Battle of the Standard in 1138, having contributed greatly to King Stephen’s victory over King David of Scotland, was created by that monarch Earl of Derby 1138. He married Hawise deVitre. William de Ferrers 3rd Earl of Derby (m) Lady Sibilla de Braose (Sybil de Braose ) and had: Succeeded and had many honors added: became a Crusader 1190, 3rd Earl of Derby, Earl of Ferriers, 1167, died in 1190 at Acre. Other reports say he died after 31 December 1189 Seige of Acre, Jerusalem, Palestine buried before 21 October 1190 Normandy, France William Accompanied King Richard the Lion Hearted to the Holy Land in the 3rd Crusade where he lost his life at the seige of Acre during June and July of 1191. Other reports say he died 21 October 1190 Seige of Acre, Jerusalem, Palestine buried Normandy, France William (Robert) de Ferrers 4th Earl of Derby (1136-1190) Derby, Derbyshire, England Was arbitrator between the Kings of Castile and navarre 1190; took the Cross 1187, became a Crusader 1190, married Sybilla Breckwork, daughter of Lord Breckwork. He died before Acre 1190. Other reports say: William married Sibyl deBraiose. (she was born about 1157 Bramber, Sussex, England and she died after 05 February 1227/28 England her father was William, Lord of Bramber De Braiose) They were married about 1173/74? In Sussex, England. William de Ferrers 4th Earl of Derby b. 1162 Ferrers, Derbyshire, England died 22 September 1247 (m) Agnes de Keveliok, (some say Lady Agnes Meschines de Chester) daughter of the Earl of Chester and had Other reports say of Agnes: 1192 – Agnes, Lady of Chartley De Keveliock – daughter of Hugh, 6th Earl of Chester De Keveliock.Interesting that Lady Agnes Meschines Chester of King Swen’s lineage and King Alfred the Great’s lineage and Lady Godiva as well. It is also recorded that Alfred the Great King of England (m) Lady Ethelbirth, had Princes Ethelfleda who (m) Ethelred Earl of Mercia and had Lady Elfwina who (m) Edulf of Devon and had Leofwine, Earl of Marcia who (m) Lady Alward of Anglia and had Leofric the Great, Earl of Mercia who (m) Lady Godiva ov Coventry Town, who when wearing no clothes rode a horse through the streets protesting the condition of the people (the story states that Leofric ordered all inside while allowing her protest, threatening to kill any who looked). Together, they had Algar[ Aelfga] Earl of Mercia rwho (m) Lady Alversa [Aelfgifu?] and had Edwin, the Last Earl of Mercia, killed in Battle in 1071, but was the father of Lady Lucia who (m) Randle de Meschines, first Earl of Chester and had Randle, Earl of Chester who (m) Lady Bertred de Evereaux, and had Lady Agnes Meschines de CHester who (m) William de Ferrers, 6th Earl of Derby and had John Ferrers de Stebbing. He rebelled against King Henry III and was arrested and imprisoned first in the Tower of London, then in Windsor Castle, and his lands and earldom were forfeited. .Interesting that Lady Agnes Meschines Chester of King Swen’s lineage and King Alfred the Great’s lineage and Lady Godiva as well. The Stebbing parish was held by Siward in the reign of Edward the Confessor, and by two Norman Lords, namely, Henry de Ferrers and Ralf Peverell in the time of William the Conqueror. It is divided into three Manors, 1. Stebbing Hall 2. Porters Hall. 3. Friars or Priors Hall. The Manor of Stebbing Hall belonged to Ralf Peverell, who held the larger portion of the Parish; he married Maud, (daughter of Ingelric, Founder of the Collgiate Church of St. Martin le Grande in London) concubine to William the Conqueror when Duke of Normandy. Her son William, surnamed Peverel, was created Earl of Nottingham and possessed 125 Lordships. The Lordship was vested in the De Ferrers family which Dugdale considered to be the most noted in England. Henry de Ferrers was one of the commissioners appointed by the Conqueror to survey Worcestershire; he held 210 lordships, of which five were in Essex, namely Sileteia, Stibengha (Stebbing) Stepla, Udeham and Cinga or Ginga (Buttsbury). Robert, Earl of Derby and Nottingham founded the Priory of Woodham Ferrers : his son William was with King Richard 1st in the Holy Land, and was killed at the siege of Acon in 1191. Robert de Ferrers, the last Earl of Derby, siding with the Barons against King Henry the Third, was deprived of his cast possessions ; but after three years imprisonment, his lands were restored on condition that he should pay fifty thousand pounds to Prince Edmund, which, he failing to do, the lands were made over to the Prince. William de Ferrers, father of the above, gave his second son the manors of Woodham, Stebbing, and Fairstead with one messuage in Chiche, by which the Essex Estates were saved to the Family. 1339 Henry de Ferrers obtained a Charter for a market and fair to be held in this Parish. In the Fifteenth Century this estate [Stebbing] passed by marriage to Grey of Ruthin, and in the next centure it was alienated by the Duke of Suffolk to Sir Robert Southwell : He sold it to King Henry the Eighth, who exchanged it in 1545, with Sir Giles Capel. The Earl of Essex is the present  Lord of the Manor and owns the greater part of the Parish. The Manor of Porter’s Hall was held in King John’s reign by John de Stebbing, a younger branch of the De Ferrers family. in 1265 by Gilbert Dunstavill, who had “an extent” of taken. 1296, William de Umfravill died possessed of a portion of it. Henry and John Porter were the owners in the reigns of Edward the Firts and Second. 1328 Bartholomew de Badlesmere was possessed of it. The Rectory was annexed to the Lordship of Stebbing. In the time of Henry the Second, William de Ferrers gave the church with the great tithes to the Hospital of St. John of Jerusalem; The grant was confirmed by his Son Robert and a vicarage ordained of which the Prior continued Parton till the dissolution of their order, when the Patronage fell to the Crown. 1567, Humfrey Cornewall alienated them to William Tiffin, Esq. 1575 they were sold to William Fitch Esq. 1585 to William and Bartholomew Brooke. 1601 to John and Thomas Sorell, whose descendant Roger Mansir sold them early in the Eighteenth Century to Arthur Batt, Esq. of London, Merchant. The Impropriator in right of the Rectory, holds the Manor of Prior’s Hall. A Chantry was founded in the CHurch by Sir John Bultell, Clerk, and in Obit by John Gunnock. In the Parish are two apparently artificial [man made] mounds, on one of which tradition says there was a castle. Marriage 2 UNKNOWN in Kettleburgh, Suffulk, England The Stebbing family of England probably took their surname from theparish of Stebbing in Hinkford Hundred, county Essex (Greenlee, Ralph Stebbine & Greenlee, Robert Lemuel, The Stebbins Genealogy, (1904), pp. 13-50). “… There in the church we found a brass in the floor by the altar to Arthur Penning and his two wives, Frances daughter of William Stebbing of Kentons who died in 1559 and Katherine daughter of Anthony Broke of Cretingham who died in 1614. Arthur died in 1593. On the ceiling of the church there are several coats of Arms including the Pennings and the Stebbings. According to the church pamphlet one of the bells also has the initials A.P. indicating that Arthur donated the bell to the church and his initials are also on one of the front pews. So he was obviously and important man there. Some records suggest that [John] Thomas Stebbins (1475-1526) Married Alice Adams and had John (1503). The odd thing here is that this marriage would have happened when [John] Thomas Stebbing was 25 years of age – which is a bit old. William STEBBING b: ABT 1521 in Essex, England Some reports suggest that Alice was Alice (Williams Barker) Stebbins. Elizabeth Stebbins was born 1568. Elizabeth married John Leavens on 16 Jun 1602 in Bocking, Essex County, England. John was born about 1565. Note: Surname may be spelled Stebinge. Famous Political US Leaders has him traced in two different lines, one spelled as Stebbens and the other as Stebbins. Dennis Stebbins was born about 1590. He died 6 Nov 1590. Elizabeth Stebbins was born 7 May 1598 in Black Notley, Essex County, England. Rowland arrived in MA on November 12, 1634; settled in Roxbury MA 1634; moved to to Agawam (Springfield) MA 1639 and was granted lot # 5, 10 rods wide 24 Dec 1640; pioneer of Northampton MA 1656; Springfield MA 1663; Northampton MA after Feb 1664/5: will 1 Mer 1669/70; died 14 Dec 1671 Northampton MA: bur Northampton MA. John (1647-1724) who married Dorothy Alexander, and who was captured, along with his entire family, at the Deerfield raid, and whom some of his children remained in Canada. His death was ‘probably’ by accident at his sawmill. John and Mary Anne Munson Married May 14 1746 Mary Anne was the widow of Abraham Munson who was drowned in the Connecticut River Oct 29, 1645. (John’s son at 8 years old… )John Stebbins (b 1647) beinge taken notice for misbehavinge himself towards his aged Father calling him Old foole and uttering other unseemingly words toward him was the day abovesaid examined thereof: and the matter beinge not ripe for fynall issue, the said John Stebin did before the Commissioners bynd himselfe in the summ of Forty pounds to appeare before Authority here established to make answer for the said misbehaving himselfe to his Father when he shall be thereunto required. Pynchon Court Record, p. 234. More on John: He was a farmer at Springfield and Northampton. and in 1651 was for a time at Roxbury. He had grants of land at Springfield, and bought a house there. He was highway surveyor; selectman in 1655. In 1656 he moved to Northampton and his home was on the lower end of Pudding Lane, now Hawley Street. He owned saw mills there; was measurer of land in 1659-71 ; committee to lay out highways in 1660 ; juror in 1661 l selectman in 1675-78. He owned the covenant in the church, June 18, 1661, served on the church building committee the same year. Was bailiff 1664 ; contributed to the Harvard College fund 1672-73 ten bushels of wheat. It was commonly believed that he was killed by witches. He was part owner of the mill on Broadbrook and was killed in some mysterious way while alone in the mill. His second wife Abigail Bartlett who was killed October 10, 1710 in a fall from her horse on a visit to her children at Coventry Connecticut. Thomas took the “oath of allegiance” Feb 8 1678. He was appointed as a fence viewer and served in this role from 1696 to 1696. Sarah Stebbins was born 27 Jan 1726/1727 in Northfield, MA. She died 11 Sep 1809 in Northfield, MA. Sarah married Thomas Taylor on 1755. Thomas died 24 Mar 1778. Anna Stebbins was born 15 Sep 1731 in Northfield, MA. She died 5 Nov 1732 in Northfield, MA. Joseph Stebbins first settled in Deerfield (Franklin Co.) Mass. but in 1726 “…bo’t the William CLARKE lot (19 rods 11 feet wide)” in Northfield, and “resided there the rest of his life”. Page 167, Vol. 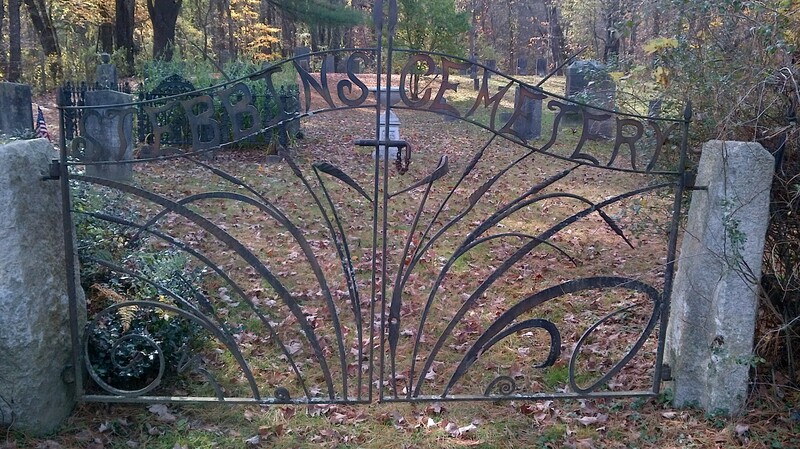 I STEBBINS GENEALOGY by Greenly cites the HISTORY OF NORTHFIELD, MASS. pages 181,230,237,277-88,also pages 19,45,65 and 315 all revealing his activities, travels, land ownership, and prowess at fighting and competing with the Indians. JOSEPH STEBBINS first settled in Deerfield, Massachusetts; but in 1726 he bought the William Clarke lot (19 rods 11 feet wide), in Northfield, and resided there the remainder of his life. He was one of the leading opponents of Mr. [Reverend] Doolittle, in the church controversy in 1736-7. His name appears in “Acc’t of Work done at Dea. Alexander’s mount”, and he is credited with the following: “JOSEPH STEBBINS—1 day hand and team £1. 6. 1 day 0. 8. 0.” In the spring of 1750, he built a log house on his lot near Ashuelot, the house standing eighty rods south of Stebbins’ island, which remained in the family for several generations. His name appears in the “list of proprietors in the fourth division of all the resident land owners and taxpayers in 1751, and the relative valuation of each”, at which time he owned one hundred and eighty-nine acres of land. At the first meeting of the inhabitants, September 25, 1753, “JOSEPH STEBBINS JR. was appointed by the charter as surveyor and on the committee to lot out the land”. On the alarm of the Indians, on the 1st of September, 1753, CAPTAIN JOSEPH STEBBINS and his family resorted to the stockade around the house of John Evans. JOSEPH STEBBINS built his house, in 1763, on the west side of the river (in what is now Vernon), covering it with rived clap-boards, which were split from oak bolts, or cuts, and five to seven feet long, eight to ten inches wide, and about one and one-half inches thick on the back. They were laid lapping, and made a durable and tolerably tight covering. The thatch used in covering the roof was nothing more than the native grass which grew in the meadow. Clary’s Island, now known as Stebbins’ Island, contains thirty acres; and is situated below the great bend, and about one-fourth of a mile above the mouth of the Ashuelot. For several generations it has belonged to CAPTAIN JOSEPH STEBBINS and his descendants. In the friendly trials of prowess and strength between the reds and the white men, CAPTAIN STEBBINS proved more than a match for his Indian rivals. In the seating of the Meeting House, in 1780, the widow of JOSEPH STEBBINS was assigned pew number twenty-four. Captain Joseph Stebbins was born at Northhampton, March 30, 1697. He settled at Deerfield, removed to Northfield in 1726 and died January 31, 1780 at Northfield. Was one of the leasing opponents of Rev. Mr. Doolittle in the church troubles, 1736-37. He built a log house near the Ashuelot south of Stebbins Island in the spring of 1750; was surveyor, elected at the first town meeting, September 25 1753. On the indian alarm of 1753 he and his family resorted to the stockaded house of John Evans. He built a house in 1765 on the west side of the river, covering it with clapboards and thatching the roof with grass from the meadow. Tabitha Stebbins was born after 1742 in Vernon, VT. Tabitha married Zurr Evans of Chesterfield. Mary Stebbins was born 6 Jun 1747 in Vernon, VT. She died 14 Oct 1774 in Guilford, VT. Mary married Timithy Root, son of Samuel Root and Mary Alexander, on 22 Jun 1773. Timithy was born 27 Jul 1743. He died 12 Dec 1843. Elijah Stebbins was born 27 Apr 1749 in Vernon, VT. 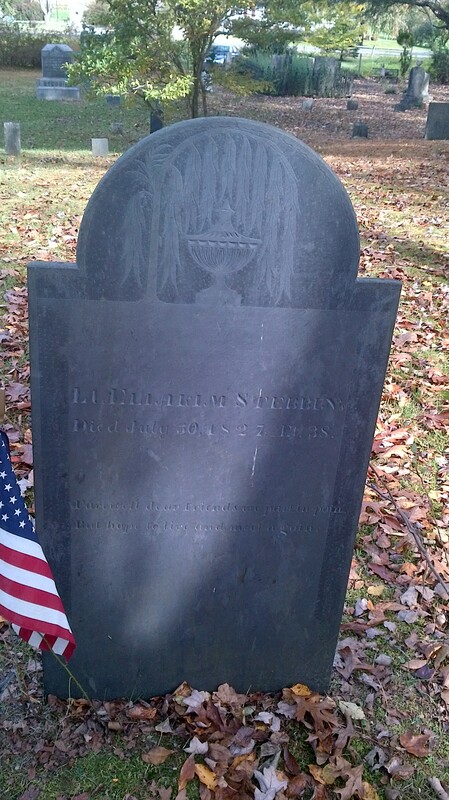 He died in Vernon, VT.
Lucy Stebbins was born 31 May 1752. Joseph Stebbins (II) Occupation, farmer. Politics, whig. Religion, Congregationalist. Resided at Northfield, Mass., and Vernon, Vt.
JOSEPH STEBBINS settled in what is now Vernon, Vermont, about 1740. )Vermont Hist mag V p 287) He bought a large farm of excellent meadow and plain, from the Merrimans on May 21, 1749, the deed of which is the oldest deed recorded by John Bridgman, first Town Clerk of Vernon (or Hinsdale), County of Cumberland, Province of New York. (Re-recorded March 16, 1799, in Book I, page 128, the Town Records of Vernon having been destroyed by fire June 11, 1797.) The third oldest deed was dated the “26th year of his Majesty’s reign (George )”, and was from Titus Belding to JOSEPH STEBBINS, Feb. 2, 1753. Hinsdale (now Vernon), on the west side of Connecticut River, was granted p-275. by charter of said Hinsdale Sept. 5, 1753, under the seal of the Province of New Hampshire to Fourteen Proprietors who lived within the Province of New Hampshire at the time said charter was given, viz: Ebenezer Hinsdale, Orlando Bridgman, Benoni Wright, Robert Cooper, Caleb Howe, Daniel Shattuck, John Sargent’s Heirs, Peter Evans, Samuel Burr, John Evans, Hezekiah Elmore, JOSEPH STEBBINS, and Moses “Belding, In the .’ ‘ Province rate of taxes ‘ ‘ for the town of Hinsdale, in 1764, including pools, real estate and personal estate, JOSEPH STEBBINS was assessed Papers three pence. Among the “Names of those who own Land on ye East side who live other towns (Persons that live out of the town of Hinsdale) who own land for which they are rated”, appears the name of JOSEPH STEBBINS, who was then assessed three pence. On August 20, 1756, CAPTAIN STEBBINS with two of his children – Tabitha and Elijah—and one or two men. were harvesting wheat upon his farm on the plain above the meadow, east of the house (occupied in 1872 by his grandson, John Stebbins.) Two Indians had discovered the reaping party, and lay in ambush among the thick alders in the hollow ten or twelve rods North of the house, watching them. Joseph’s brother Zebediah Stebbins [Hoyt in his history of Indian wars, is mistaken in Stebbins’ Christian name, and the date of the month. Hoyt called it Zebulon. It was Zebediah. Hoyt ‘s date was June 20th instead of August 20th, 1759], brother of CAPTAIN JOSEPH STEBBINS, and Reuben Wright came from Northfield, five miles distant, on horseback, and discovered the Indians in ambush. One of the men said, “Are they white men or Indians?” At that both Indians rose, fired, and wounded Wright in the arm, which bled profusely at first. The men fled up the path in the hollow south of the Stebbins’ Cemetery. The Indians pursued with vigor, expecting no doubt that Wright would fall from his horse and they would obtain his scalp as a trophy of victory. The white men had but one gun, and after crossing Island Brook, about one hundred and twenty-five rods west of the conflict, Stebbins, requesting Wright to hold his horse, said he would return and endeavor to kill at least one of the Indians as they came up the brook. Accordingly he took his position, and as they came up the bank (history states he received another fire from them) he fired, when one of the Indians leaped up in the air and exclaimed “Ugh!” then fell prostrate to the ground. Stebbins mounted his horse and the two proceeded on their way, crossing the river by swimming their horses, as was the custom in the Indian wars, to Fort Hinsdale, New Hampshire, built by Colonel Ebenezer Hinsdale in 1743, which was situated nearly opposite Fort Sartwell in Vernon. The next day a party of men from the fort went and examined the ground and found blood in the road where the Indian had fallen. When the Indians fired on the two men on horseback it probably prevented CAPTAIN JOSEPH STEBBINS and his reaping party from being killed or captured by the Indians; for, on hearing the report of the guns they knew there was trouble near. The father seized Elijah, placed him on his back, ran across the meadow, re-crossed the river, and returned to a little fort, or fortified house, on the farm (owned in 1872 by Edward Stebbins), from whence the party had come. Later, On August 17, 1869, Mr. George M. Lee was digging up stumps and leveling the land on his farm in order to use a mowing machine, when in one place he plowed two furrows deep, struck a stone, and on taking it up found more under it. He then took his shovel and dug up three or four bushels of flat stones laid around in regular order in a circle about two feet in diameter, and beneath the stones was an Indian grave and some remains of a skeleton were to be seen, buried four or five feet deep, in a sitting posture. The grave on the south side was dug perpendicular, against which the back of the corpse was placed, facing north, as the form was still visible by the remaining marks. On the north side of the grave, which was small at the top, a hole was dug beneath the surface in a horizontal direction into which his feet and legs had been thrust. His bones were principallj’ decayed, the thigh bones appearing like some old roots, but crumbled on being exposed to the air and touch. This grave was on nearly level ground (between Stebbins’ and the County road), and forty rods south of Island Brook, from where Zebediah Stebbins had shot the Indian in 1756, one hundred and thirteen years previous to this discovery. There can be little doubt but that this was the grave and remains of the Indian that Mr. Stebbins killed at that time. Eliakim Stebbins was born 17 Jun 1789. Eliakim married Elizabeth Morley on 19 Mar 1815. Eliakim was born November 17, 1753, at Vernon, Vermont; died July 28, 1836, at Vernon Windham County, Vermont; Occupation, farmer; politics, whig; religion, Congregationalist. Resided at Vernon. Vermont, and Northfield, Massachusetts. Eliakim, their 5th child, born Nov. 17, 1753, married Aug. 1785, Rebekah, daughter of Col. John Hawks of Deerfield Mass., who obtained in history the title of Hero of Fort Mars, for his defense of the same in the French and Indian war of 1746. He died 1785. Eliakim settled in Hinsdale, N. H., (now Vernon) and was found dead sitting in his chair, July 28, 1836, age 82. Their children were Solomon, Eliakim, jr., Rebecca, John. Lorenzo Stebbins was born 15 Nov 1827 in Vernon, VT. Lorenzo married Ellen O Walton on 12 Aug 1856. John Stebbins (1794) was a prominent citizen of Vernon, Vermont. He was Justice of the Peace (not confirmed, but certainly had title of Esq) , and held many offices of honor and trust, several times representing the town in the State Legislature. He was a man of the most absolutely strict integrity. While he shunned general society, he was a genial and delightful companion to the few whom he admitted to close friendship. Alfred Stebbins was born 4 Sep 1834 in Vernon, VT.
Alfred married Edith Large, daughter of (William P Large and Sally Rowena Guthrie), on 13 Dec 1869 in Dubuque, IA. Edith was born 21 Oct 1845 in Putnam, OH. She died in Oakland, CA. Elwyn Wilfred Stebbins was born 15 Sep 1870. Londa Loleta Stebbins was born 30 May 1872. ALFRED STEBBINS graduated at Amherst College August 9, 1860, and spent several years teaching in the South and West. In 1863 he went to California, where he was employed in the custom house, and was afterwards deputy collector of internal revenue. He was a mounted rifleman in the frontier service and traveled many thousand miles. While in California, he was also librarian of the Mercantile Library at San Francisco. Profession: Librarian. Politics: Republican. Religion: liberal. Alfred is credited as one author of “Alfred Stebbins autograph collection, 1834-1872” which Consists of letters, autographs, and photographs of artists solicited by Stebbins and pasted in his copy of Henry T. Tuckerman’s BOOK OF THE ARTISTS (1867), extra illustrated edition. Among the artists are Christopher P. Cranch, F.O.C. Darley, Sanford R. Gifford, Eastman Johnson, Miner K. Kellogg, John F. Kensett, Jervis McEntee, Samuel F.B. Morse, Thomas Nast, Erastus D. Palmer, George H. Smillie, John Vanderlyn and Worthington Whittredge. This and his comment in a letter to John Muir in 1894, “Our friend, Keith, is mounted high on a new God. He has struck the method of coloring of the old masters! …You’ll have to come down & see him in the new frenzy! !” suggest that Alfred appreciated nature, and the arts. Mr Stebbins is at present engaged in mining engineering in the Sierra Nevadas in the southeastern part of Butte county. He is a graduate of the Massachusetts School of Technology and has been a student in the mining department of the University of California for several years having completed hie course here last December. He is a member of the Chi Phi fraternity having affiliated with that society when in the East. Dear Betty, I don’t know much about my mother’s past in terms of documents and letters. Margaret Long was deserted by Thomas Mitchell Long and raised her five children pretty much alone, although he sent money now and then. He apparently was very able and erratic, and had a compulsion to tell employers how to run their business. (All this is hearsay). Margaret Long taught Elementary School. She had it pretty rough. Her father, according to Jess’s account, was a darling. Aunt Jess was Marian Long Stebbins sister. He (Marion’s Father) was also a very good candy-maker and supported his family here by that Talent. Mother [Marion] learned from him and use to make wonderful candies. I remember some of the craft, but never did it on my own. Nor do I know much about my grandmother, Edith Large Stebbins, except that she was well-educated, fairly well-off, that her mother was quite a woman and helped slaves escape through the underground. Edith was quite poor, after Alfred died, and babysat, whatever, but later became quite wealthy through some land purchases Alfred had made in [Spokane] Washington. So Alfred’s land speculation gave us all what extra monies have come to us. Margaret (Peggy) Stebbins had no children. Margaret is said to have graduated from Stanford University (other reports say attended Berkeley) , was a gardening expert who co owned the Page Mill Nursery near Palo Alto California. Linda Stebbins mentions that she and Keith Stebbins visited aunt Peggy in Carmel, California. Michael Stebbins (son of Keith) mentions that he enjoyed visits with Margaret and her partner Margaret Truax at the Palo Alto Nursery where they would let him drive the tractor around and would cook, “unusual dishes you could not find elsewhere – and that were also delicious.” Some reports show Margaret died in July,1970. estate in Hayward after the school was relocated to the Stanford campus in 1936.
gardeners. At least some of their stock must have come from the Hayward estate. school, Edith Hollis Brattin, at her native plant nursery in Carmel Valley. Records show that Edith died in or near Modesto in 1992. Karen Lea Hughes Stebbins was of the Hughes Jackson line. Nice site. One important omission: the first John Stebbins had five, not three children by his first wife, Anne Munson: John (1647-1724) who married Dorothy Alexander, and who was captured, along with his entire family, at the Deerfield raid, and whom some of his children remained in Canada, and from whom my wife is decended; and Thomas (1649-1650). hi, do you have documents to connect stebbens family back to 818 b.c. and to William the conqueror. i FIND THIS VERY INTERESTING this is my family also. I found this site by accident…I grew up in the Stebbins Ferry house in Northfield ma. on the banks of the Conn river, build in 1763 for John Moffatt , An old Northfield map shows Sarah and G.R. Stebbins living there..The house still stands through several floods over the years. Occasionally I see post cards on Ebay of the Stebbins ferry house. I have collected a few. You’ve may have been in contact with my father, Daniel, at some point. The genealogy back 2 millenia is astounding. So far, we’ve confirmed 1643 & Thomas Stebbins, as the first to come here. Great fund of ancestral information. I have a slight connection to the Stebbins ancestors as on of my Canadian ancestors (Jean-Baptiste (Jean) Vien(s) married Charlotte LeGrain daugher of Adrien Legrain and Therese (formerly “Thankful Stebbins” of Deerfield, Mass”. Wonderful history about this brave young girl. You might want to check out her history. I am proud to be related to the Stebbins family, going back to Rowland….it makes me a 9th cousin, once removed, to Spencer Tracy. Three cheers for the Stebbins folks! !